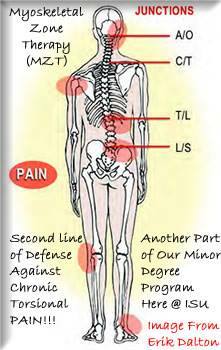 Theories and treatment procedures have long been based on the concept that postural stress resulting from faulty alignment of body segments is a major factor in the development of musculoskeletal pain and premature degenerative arthritis. Evidence obtained from magnetic resonance imaging (MRI) procedures has recently helped bridge the gap between clinical observations and scientific knowledge. These findings provide support for some of the traditional, posture-based treatment approaches. Because we humans stand and walk upright against the unrelenting force of gravity, our bodies are exposed to constant stress. Normally our rigid yet pliable bones when constrained by flexible ligaments and moved by muscles with sufficient strength, provide good support against this constant stress. 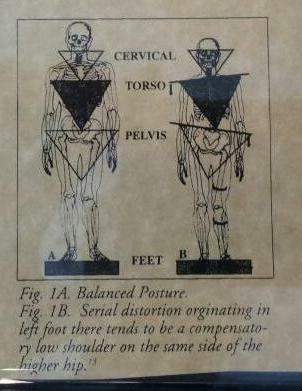 When the alignment of body parts is altered, the stresses are changed, and this may lead to various types of biomechanical problems. 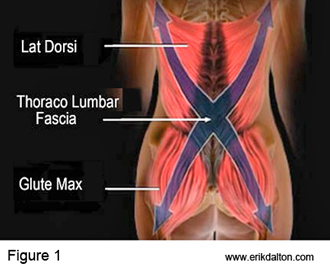 Both the soft tissues and bones must respond to these changes or be damaged. Microtrauma (the small but repeated damage to tissues) eventually is revealed as a clinical complaint (usually pain) prior to any overt signs of physical injury. The reduction or removal of biomechanical dysfunctions is a rational treatment approach. A baseline-limited MRI examination was performed on both lower extremities of 12 asymptomatic volunteers; then the volunteer subjects inserted a 9/16 inch longitudinal metatarsal arch pad underneath the lateral aspect of one foot to increase unilateral foot pronation. They were instructed to wear this pad in all shoes for two weeks, and not to alter their usual activities. After two weeks of altered weightbearing, follow-up MRI studies were obtained in all subjects. The pads were then removed from all volunteers, and a small group was randomly chosen for a third MRI evaluation two weeks later. The images obtained after two weeks of altered foot biomechanics showed numerous areas of increased marrow signal intensity on the T2-weighted (fat-suppressed) images, indicating bone marrow edema in 11 of the 12 subjects. These changes were seen locally (as expected) throughout the metatarsophalangeal region. More importantly, bone marrow changes were also seen in the long bones along the kinetic chain to the hip joint, affecting the tibia and/or femur of six of the 12 volunteers. Two weeks after removal of the pads, the lower extremities of three randomly selected subjects were again evaluated by MRI. The previously seen marrow changes were significantly decreased in all, and had completely resolved in two of the three. Clinically all of the volunteers complained of discomfort while wearing the foot pad, which resolved completely upon its removal. When bone is exposed to excessive, long term stress, it responds by attempting to repair and strengthen its internal architecture. A stress fracture results when the repair process is overwhelmed, and the bone tissue fails. If additional bone can be laid down fast enough, a stress fracture is avoided. But the additional bone tissue may increase the bone’s rigidity, accelerating the development of cartilage damage at the adjacent weight bearing joint. Plain film radiographs are insensitive to the early changes in bone associated with biomechanical lesions (bone marrow edema, early stress fracture, etc.). Stress fractures are usually seen as subtle areas of periosteal response without evidence of cortical or medullary abnormality. The most sensitive imaging modality to detect early stress injury to bone is magnetic resonance imaging. MRI provides not only good anatomical localization, but also gives useful physiological information concerning bone tissue. Bone marrow edema is identified by a diffuse, heterogeneous pattern of decreased signal intensity on T1-weighted images that becomes hyperintense (white) with T2-weighting. Specialized T2-weighted fat suppression (STIR) images are often necessary to identify small areas of marrow alteration. 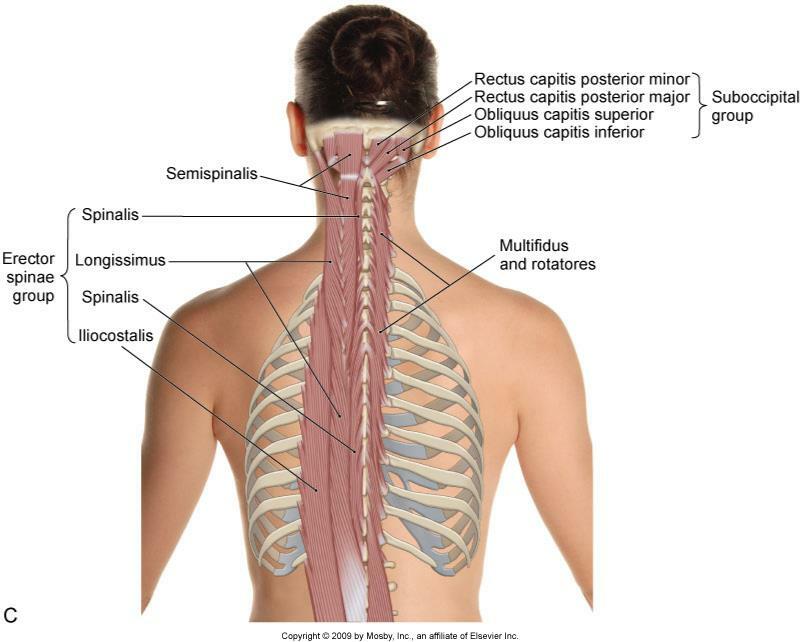 Although little direct evidence has previously been presented to substantiate posture-based treatment approaches, these techniques have survived because of positive clinical results and anecdotal information. Using MRI information, early physiologic changes in bones in response to altered biomechanical stress (e.g., bone marrow edema) can be observed. These findings are of major significance for two reasons. First, the results demonstrate not only the detrimental effects of altered biomechanics on bones and joints, but also the rapid benefits of the removal of functional misalignments. Secondly, this paper provides direct evidence of the specific effects of excessive pronation at the foot and ankle on the bones of the lower extremities, up to the level of the proximal femur and hip joint. Application of the concepts and information presented in this research helps reinforce the long-held premise that posture and leg length inequality in weightbearing is clinically important. 2. Resnick D, Niwayana G. Diagnosis of Bone and Joint Disorders, 2nd ed. Baltimore: Williams & Wilkins, 1988: 1371. 4. Mink JH, Deutsch AL. Occult cartilage and bone injuries of the knee: detection, classification and assessment with MR imaging. Radiology 1989; 170: 823.